Specializing in Clock sales, service, and repair, Keil’s Clock Shop is an authorized dealer for Howard Miller clocks, Hermle clocks, Bulova clocks, Seth Thomas clocks, Sligh clocks, Rhythm clocks, River City Cuckoo clocks, North Coast Imports, Kit-Kat clocks, and others. We carry hundreds of different models to choose from. 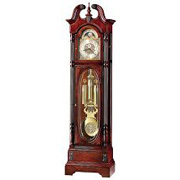 We sell grandfather clocks, wall clocks, mantel clocks, floor clocks, cuckoo clocks, motion clocks, antique clocks and more. Clocks are what we know and all we do. Keil’s Clock Shop is also an authorized service center for Howard Miller, Ridgeway, Sligh, Hermle, and Seth Thomas. We do expert repair on all types of clocks, from antique to brand new. We are Located at 109 E. Main St. in Belleville, Illinois. Please feel free to stop in and visit us at our showroom. We specialize in the repair of most grandfather clocks, wall clocks, mantel clocks, antique clocks (American, German, French, etc. 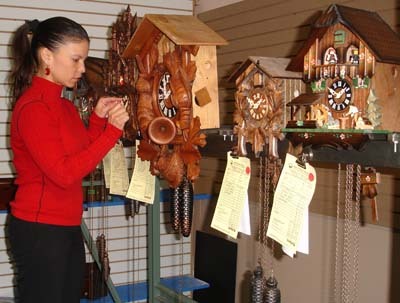 ), cuckoo clocks, anniversary clocks, bracket clocks, kitchen clocks, wall regulators (one weight, two weight, three weight, and spring driven), English tall case clocks, Fusee clocks (single, double, triple), ships bell clocks, Sonora chime clocks, OG, and many more. We also rebuild and replace many modern German mechanical movements, and replace old battery operated movements in quartz clocks. Our web site clocks are broken up into easy to navigate categories. From years of sales experience, we feel we have designed a layout most customers will find efficient and user friendly. You may search for clocks from the product menu, perform a direct search, or simply click on the icons in the middle of the page. Clocks are broken up into categories by the intended placement of the clock, power source, color, style and manufacturer. The “Mantel clocks” category encompasses any clock that is designed to sit on a mantel, table, or shelf. Mantel clocks can come with either battery operated (quartz) movements or a mechanical weight driven or spring driven clock movements. There are many different styles of mantel clocks. A few of the more popular styles are: Camelback or tambour clocks (some even refer to these clocks as Napoleon’s hat), Brackett clocks, anniversary clocks and flat-top mantel clocks. The “Wall clocks” category encompasses any clock that is designed to be suspended from a wall. Most wall clocks are either quartz clocks or mechanical clocks. Electric clocks are becoming very rare and only a select few are available. A few of the more popular style wall clocks are: Schoolhouse clocks, wall regulators, two weight regulators, gallery clocks, railroad clocks, and these days Rhythm motion clocks. The “Grandfather/floor clocks” category encompasses traditional style grandfather clocks, contemporary style grandfather clocks, and floor clocks with furniture trend designs that can be weight driven or battery operated.